SOUTH LOOP — First lady Michelle Obama said programs that empower otherwise underserved youths by giving them access to internships allow them "to envision a life beyond gangbanging." "We all must use that spotlight we have — the platform — to show young people around this country that there is so much to dream for," Obama said, after relating her experiences of growing up on the South Side and thinking about what it would be like to work Downtown. Obama appeared at Columbia College Chicago Thursday morning and spoke to dozens of high school graduates assisted by Urban Alliance Chicago. The organization is known for its yearlong mentorship and employment program offering underserved youths the chance to work with one of 60 companies. During the 2012-2013 school year, 71 students from six Chicago public high schools participated. One of those students is Antonio Martinez, a graduate of West Lawn's Hubbard High School who will attend Columbia College in the fall. "It's helped me grow to become more independent and professional in my life," said the aspiring graphic arts student. "I want to hear from her [Obama] about her thoughts on youth empowerment, especially from the perspective of a mother and first lady." Next school year, the program will more than double to include 150 students across 13 schools. The program has accepted applicants from Curie, Dunbar, Hubbard, Phillips, Julian, Marshall, Muchin, Farragut, Wells, Kenwood and Steinmetz high schools. 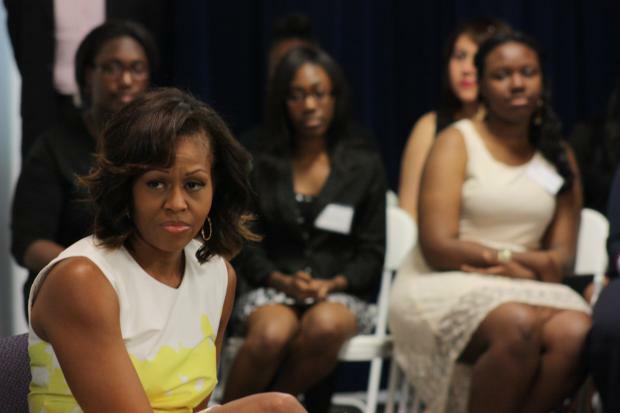 Briana Miller, a graduate of Dunbar Vocational High School, asked Obama's advice on coping with going to college next year, given the first lady's experiences as an African-American on Chicago's South Side. Obama told Miller to embrace her current support network. "I've embraced my background, and I want all of you to do that no matter where you go," Obama said of her jump from her South Shore neighborhood to a "dorm room at Princeton University." "You don't turn your back on what got you here," she said. Mayor Rahm Emanuel and his wife, Amy Rule, a leader of Urban Alliance, also spoke at the event.